These LCD TV Stands Ship Unassembled. 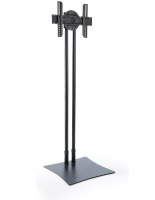 These Steel Post and Weighted Base Displays are Durable. These LCD TV Stands Have Easy Cable Management. 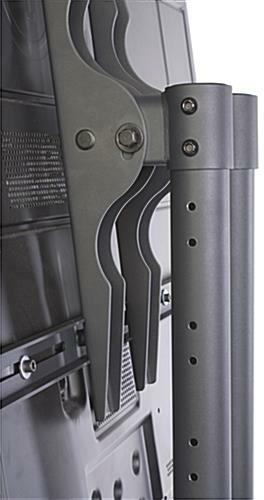 Adjustable VESA bracket holds most 32"-84"+ flat screens weighing less than 175 lbs in landscape or portrait orientation. 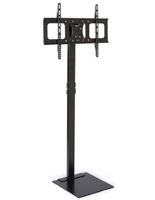 Extra tall post is height adjustable to ten levels, ranging from 48-1/4" to 84" from floor to center of tv bracket. Heavily weighted base for a sturdy stand. Includes hardware kit with various sized screws to mount screens to the bracket.However, some televisions may require specific screws that are available at most hardware stores. In-post wire management to hide television cables. 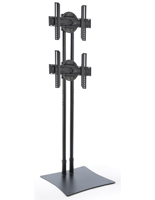 These lcd tv stands that adjust to ten set heights allow users to position screens at the perfect viewing level. 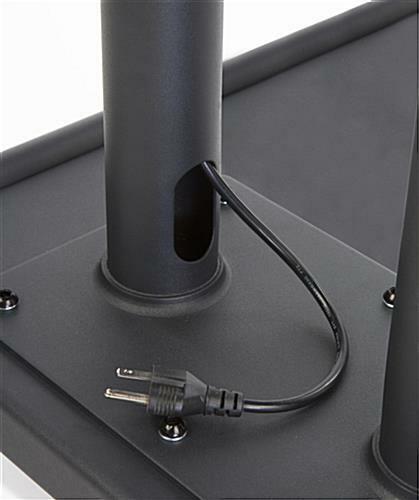 This flat panel holder includes a heavily weighted base to ensure stability of the stand. These extra tall flat screen posts, lcd tv stands that accommodate 32" to 84"+ plasma monitors create a hard to miss display. 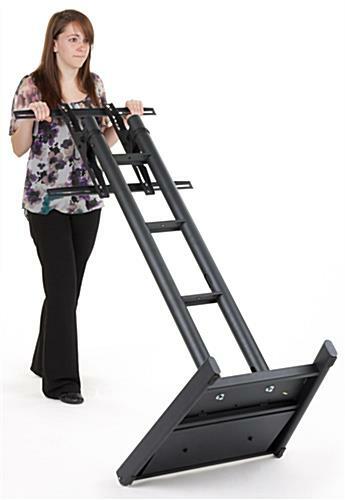 This plasma screen holder is ideal for promoting and conveying new information in many businesses. 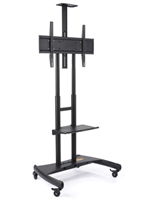 This lcd tv stand is versatile and can be utilized in small or large businesses, universities, hotels, and more! These floor carts are designed with a weighted base to avoid unwarranted movement. There are two wheels on the base of these lcd TV stands to move when desired. The included bracket is VESA compatible, making it simple to mount your plasma television. The included mount extenders that come with these lcd tv stands ensure that this plasma display is compatible with most 32" to 84"+ screens. 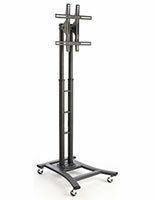 This flat screen post includes a hardware kit with many different sized screws to fit many television mounting options. 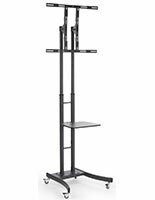 These black finish lcd TV stands, also known as freestanding flat screen carts, are a cost-efficient mode of conveying information to customers or employees. This tall post for plasma screens take up little floor space and provides users with a moveable yet stable display. 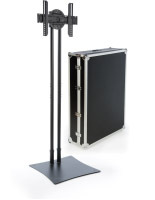 These economy lcd TV stands are extra tall making them great for use in large establishments. When mounting on the wall or from the ceiling is not an option, this freestanding fixture is ideal for businesses or even trade shows. 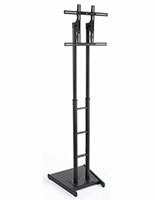 These lcd TV stands that are extra tall can be adjusted to the desired height and have a tilt of up to 15 degrees! 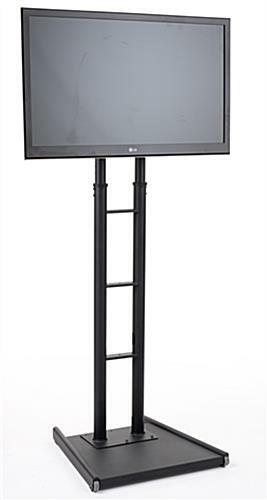 This flat screen display post is great for conveying important promotions and information! 26.0" x 90.0" x 26.0"